We’ve previously highlighted that insurtech funding has remained stable in recent years. When we take a closer look at the funding trends per insurtech category, we notice that the Health Insurance category leads in both Q3 and overall funding. We’ll highlight this observation with some graphics and discussions below. 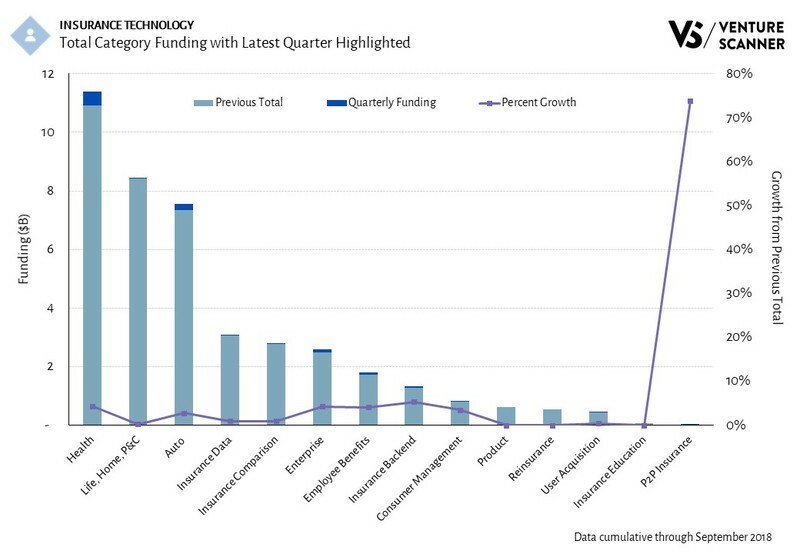 To start off, let’s review the amount of funding raised this quarter per category within insurance technology. The above graphic highlights that the Health Insurance category leads the sector in Q3 funding with $480M. Its funding is 2.4 times the funding of the next category, Auto Insurance at $204M. Health Insurance contains companies that offer health-related insurance products for consumers and businesses. Some example companies in this category include HealthSherpa, GoHealth, Oscar, and Stride Health. Let’s now investigate how the insurtech categories’ funding compare with each other historically. 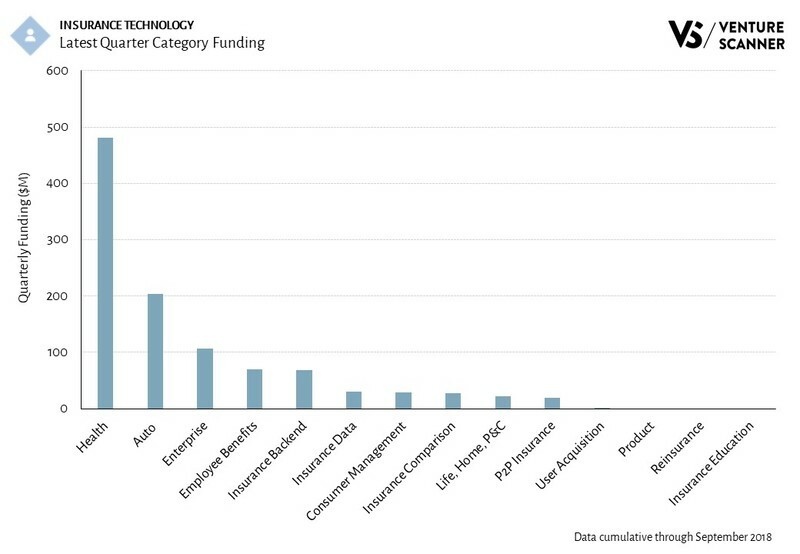 The graph below shows the all-time funding for the various insurance technology categories. The Q3 funding and growth rates of these categories are also highlighted. As the bar graph indicates, the Health Insurance category also leads in total funding at $11.4B. Life, Home, P&C Insurance category follows in second place with $8.4B in total funding. In summary, Health Insurance category leads the insurtech sector in funding. Let's see how the the rest of 2018 shapes up for insurance technology! To learn more about our complete insurance technology report and research platform, visit us at www.venturescanner.com or contact us at [email protected].